Message Boards - Boba Fett Fan Club → Creative → The result of pure boredom. Topic: The result of pure boredom. Re: The result of pure boredom. .....I just dont know what to say.....thats pretty funny. Haha!! Both of those are HYSTERICAL!! Great fun! omg, thats funny! I do that kind of stuff in school too. 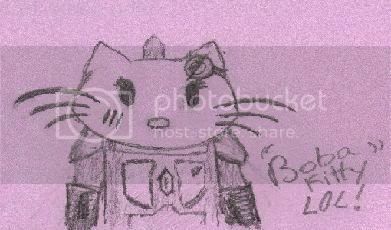 Thank you Miba for finding it and posting it i looked quick for it but eh o well it's still a funny pic, does the mando helmet you drew fairyblood have hello kitty on it or is it strictly mando? Strict mando. But I'm thinking about designing a hello kitty mando helmet. I'll post it if I like how it turns out. In my book Pikachu is more preferable then Hello Kitty.... As much as I want to smack Pikachu for giving Pokemon the "kiddy" reputation, Hello Kitty is way, way, wrose. Pikachu's a cutie, no doubt. But Hello Kitty would drop kick him royal in pure style. mouse vs. kitty... electric powers v.s mando machine...hello kitty wins hands down. Forget Picasso, that is what I call a work of art!